It’s a Salon Thing! is what we all want from a salon: individualized service with experienced stylists and quality products. Here at It’s a Salon Thing!, clients receive personal attention in a botique style salon nestled in a relaxing spa setting. Every visit is made special and tailored to your individual needs. You and your hair are the priority and focus, with service that is delivered with confidence, integrity, and passion. You will be given the BEST at It’s a Salon Thing! so that you always look and feel yours. My name is Michal Dildine. I own and operate. It's a Salon Thing! Originally from Nashville TN, I started my career in Illinois and moved to sunny Florida 6 years ago. I am a wife and mom and have been doing hair for 18 years. During these years I have continually grown as a hair stylist and business owner. I believe in keeping current by attending cutting and coloring classes so I stay knowledgeable on new trends and reminded of timeless classics. Plus working side by side with my daughter keeps me on my toes! 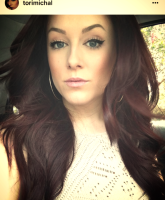 As for now, I have the pleasure of working with her as she is a colorist here at It's a Salon Thing!. I look forward to meeting you in my chair! photographing things I love, my goal is to capture and share the beauty of my subject. I look forward captureing yours!